PO 34. Describe advantages and limitations of the following fertilizer placement methods. Injection is used to place liquid or gaseous fertilizer below the soil near plant roots. Disadvantages: slow, expensive (requires specialized equipment. 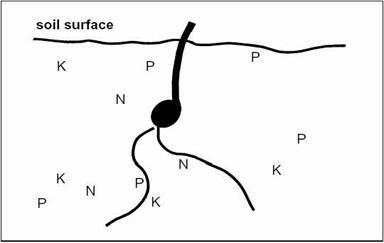 Surface broadcast is a method by which fertilizer is applied on the surface across an entire field. High capacity fertilizer spreaders are often used which spin dry fertilizer or spray liquid fertilizer on the soil surface or on a growing crop. Broadcast incorporated improves on the efficiency of surface application by incorporating fertilizer through plowing or disking. Plowing is considered better in terms of nutrient availability, as it creates a nutrient-rich zone a few inches below soil surface (where developing plant roots can absorb it). Band application is also known as starter application. Fertilizer is applied in bands near where developing roots will easily reach it; either to the side and below the seed rows, slightly below the seeds, or in between rows. A common practice is to band fertilizer 2 inches to the side and 2 inches deeper than the seeds or plants. This provides the plants with a concentrated zone of nutrients and can improve nutrient use efficiency. The process can be done before or simultaneous with planting or seed drilling. Liquid or dry fertilizers can be used. Advantages: high nutrient use efficiency, jump-starts early growth. Many fields are deficient in P, due to soil binding and cold temperatures. Banding P makes it easier for plants to grow. It also slows NH4+ conversion to NO3- (nitrification), reducing the risk of leaching. Fertigation is distribution with water-soluble fertilizers and chemicals through an irrigation system. Foliar application is application of a small amount of fertilizer or mineral through direct spraying onto the leaves. Sidedressing is when fertilizer is applied between rows of young plants to provide a boost during periods of rapid growth and nutrient uptake. The most common use is sidedressing N on corn plants. 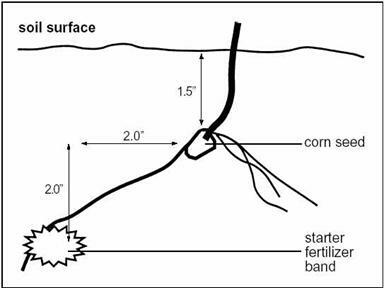 Application amount is dependent on the results of a Pre-Sidedress Nitrate Test (PSNT) done when corn plants are 12-24 inches tall. Topdressing is when fertilizer or manure is spread on established fields (grasses, legumes). Seed placement is also known as pop-up application. 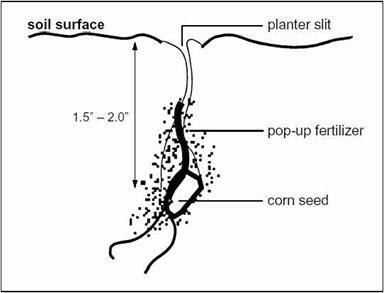 A small amount of fertilizer is placed with corn seeds during planting, sometimes in conjunction with banding. Both liquid and dry can be used. Disadvantages: can be phytotoxic if too much fertilizer is applied; retro-fitting planters can be expensive. Urea and DAP cannot be used, and to prevent salt burn the total rate must be kept below 10 lbs of N + K2O.